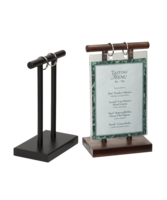 This wooden table tent presents your desserts and wines, your banquet facilities or daily specials plus anything else that will generate revenue, all at the same time. Clear pockets hang by two rings and flip over to the back of this unit, presenting a multiple page display of up to twelve pockets (twenty-four viewing sides). You can eliminate the need for pockets by having custom cards printed, laminated and punched by your local printer. Menu stand has footprint of 5 1/2 in. x 3 1/2 in. and is 8 3/4 in. tall and holds pockets for 4 in. x 6 in. and 9 3/4 in. tall for 5 in. x 7 in. cards. Order Dark Brown stained or painted black units, both have been top coated to protect them from stains and spills. Pockets with two holes to fit these stands are available in two sizes as well as extra packs of 1 in. rings. Click here to order. 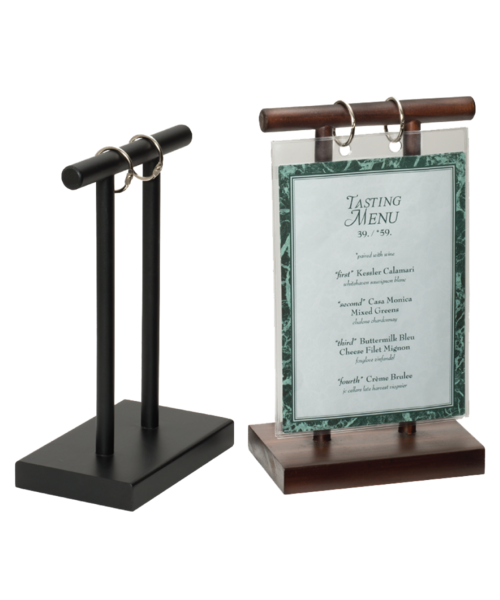 Table tents are made in the U.S. out of solid hardwood, stained dark cherry or black, then coated with matte finish polyurethane for protection from foodstains or alcohol. Shop online with the Menu Shoppe today.